Don’t put those veggies back in your refrigerator! 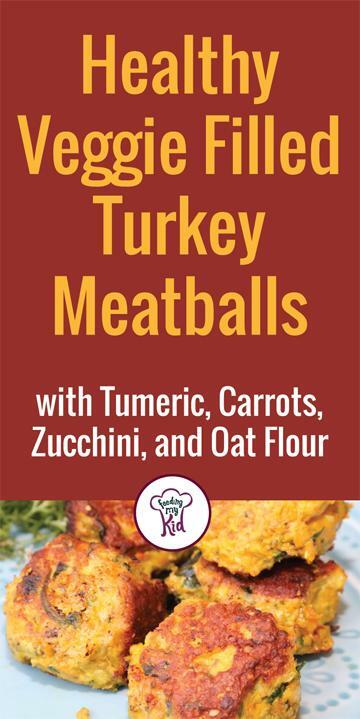 Try these delicious healthy turkey meatballs that can be tweaked to include almost any vegetable. If you need to clean out your veggie drawer, then this is your new go-to recipe. This is the easiest, blend-together meatball recipe you’ll ever make! It’s full of flavor and loaded with nutrients! Dairy-free and gluten-free, these turkey meatballs are an easy, healthy weeknight go-to when you just want to get dinner on the table. 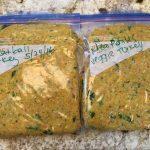 I’ve been trying to find more ways for my family to eat turmeric. Turmeric is added to curry and is what gives it that beautiful color. You’ll notice these meatballs have a vivid yellow/orange color to them. Turmeric is definitely a spice I want to eat a lot more of. Check out these amazing health benefits of turmeric. You can serve these healthy turkey meatballs on their own or as a part of your pasta dish. Make this dish even healthier and serve it with a pasta made from beans instead of flour. Watch this video to learn more about bean pasta. 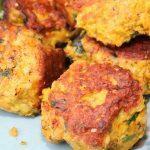 These meatballs are a great way to use up all those veggies in your produce drawer. Start by emptying the veggie drawer and throw everything on the counter. 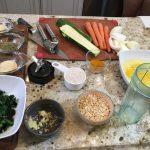 Chop off the ends of carrots and zucchini and peel back the onion and garlic. Take one cup of old-fashioned rolled oats and put that in the food processor to make oat flour. It takes about 30 seconds to blend it. Add it to your bowl. You can also use whole-wheat flour. 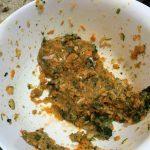 Throw the carrots, zucchini, spinach, onion, and garlic into a food processor and blend well. 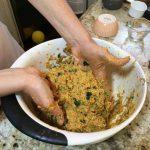 In a large bowl, mix in the rolled oats flour and 2 eggs with the processed veggies and ground turkey. Season with onion powder, garlic powder, Italian seasoning, turmeric, salt and pepper. Combine well with your hands. You can dip your fingers in cold water if the mixture sticks to your hands. Heat a frying pan with olive oil on medium-high heat. Form the meatball mixture into a dozen 1-2 inch balls. Place the meatballs in the hot pan and let them cook for 5 minutes on each side. I will prop them up on the side of the pan to cook the meatballs on each side. Cook until golden brown and cooked through. Freeze the rest. And thaw and cook when you're ready. I love doubling this recipe and freezing the leftovers. It makes for a fast and easy meal. You can bake the meatballs at 350 degrees for 20-25 minutes or cook them on a skillet turning them frequently. Baking them in the oven is often easier, but doesn't give you the crunchy outside shell.